Latest Products is pleased to introduce our complete line of disposable cart covers. No need to wash or wipe clean. 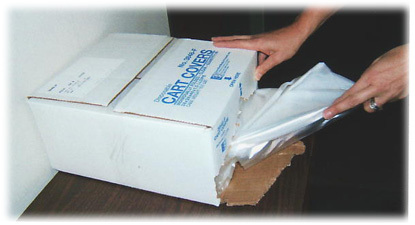 Our disposable cart covers come individually folded in an easy-to-use dispenser carton. Each carton contains 50 covers. Ideal for carts carrying sterile instruments to the surgery or trauma area and also for carrying contaminated instruments out when there is no time to wash a fabric cover. Manufactured from a linear low density polyethylene material. Recyclable but not biodegradable.